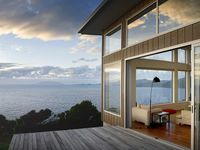 Properties in Great Barrier Island average 4.5 out of 5 stars. Property 12: Yardmaster House, large 3 bedroom home, sleeps 8. Right on the beach in beautiful Karaka Bay. 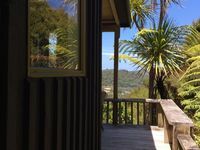 Property 18: Right on the beach in beautiful Karaka Bay. A beautiful hideaway right on the beach. Property 20: A beautiful hideaway right on the beach. Bayview, Tryphena. Overlooking Puriri Bay. Property 37: Bayview, Tryphena. Overlooking Puriri Bay. Property 38: On popular Medlands Beach, centrally located. The 4WD drive into this property is fun in itself. The view on arrival is spectacular and impossible to take your eyes off. The apartment is styled beautifully and is very comfortable. The kitchen has all you need to help the self-caterer. Hilde was a warm and friendly host who has all the information you need to help you explore the Island. We also enjoyed the Good Heaven&rsquo;s star gazing experience from the apartment. Our stay was the highlight of our honeymoon. Thank you.